“The future of the world rests on a Wobbly foundation”, declared Jasaga, a spoken word artist and IWW member, as he performed for a crowd of cheering IWW members and supporters at the Zodiac in Baltimore, Maryland, USA. Several other IWW musicians would follow his set in an energy-packed show that was headlined by IWW General Secretary-Treasurer Joe Tessone and his talented band, the Rust Belt Ramblers. This concert was just one part of a weekend of workshops, discussions, networking and fun called Wobfest 2010. 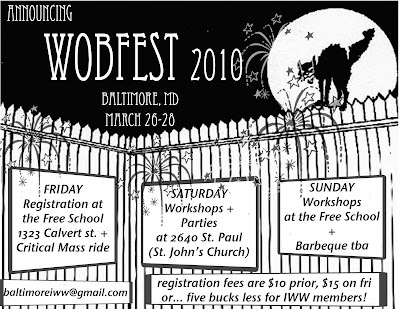 Wobfest was organized by the Baltimore General Membership Branch of the IWW as a way of bringing together IWW members and supporters from across the East Coast and beyond. The event took place from March 26-28 and drew attendees from as far away as Chicago and Ottawa, Canada. Altogether, about 50 people from at least 7 cities showed up to share their knowledge, ideas, talents and camaraderie. The weekend began on Friday with an IWW film marathon at the Baltimore Free School, a project of the IWW-affiliated Red Emma’s Bookstore and Coffeehouse collective. After watching documentaries about IWW history, the Starbucks campaign and the ISC’s 2008 trip to Haiti, many wobblies headed down to Baltimore’s Washington Monument to take part in a Critical Mass bike ride. The bike ride ended at the Black Cherry Puppet Theater where a group called Heels on Wheels performed a queer-femme cabaret/drag show. The next morning everyone gathered at 2640, a church building that has been partially converted to an organizing and performance space. After enjoying a light breakfast, participants split up to attend a series of workshops. 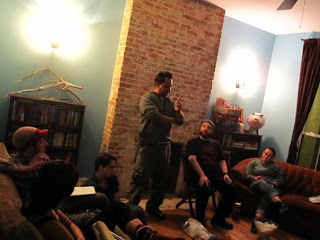 While the IWW’s International Solidarity Commission (ISC) reported back from their recent delegation to Palestine and announced the formation of a new IWW “Friends of Palestine” committee, the Red Emma’s collective led a discussion on effective meeting facilitation and group decision-making, an issue that many branches and committees are struggling with. After breaking for lunch (aided and abetted by a massive quantity of rice and bottled water provided by the Central New Jersey branch), the second session of workshops began. In one room a Baltimore-based group of low wage workers called the United Workers Association explained their innovative model of leadership development and discussed their efforts to establish a “human rights zone” for exploited workers in Baltimore’s Inner Harbor. Meanwhile, in the next room, IWW Starbucks Workers Union founder and published author Daniel Gross spoke about labor law as it pertains to rank and file workers and organizers. Following these workshops, the Gender Justice collective led a unique anti-oppression training specially tailored to help the IWW better support the rights and equality of women, transgendered people, people of color and other oppressed and marginalized groups, both on the shop floor and within the union itself. The presenters (including a local IWW member) challenged members to step outside their own identity and think about how the working class is being divided by prejudice, discrimination and inequality. After the training, Baltimore IWW member John Duda spoke about his new book, “Wanted: Men to fill the Jails of Spokane”, a fascinating collection of first-hand accounts of the important but little-understood IWW Spokane Free Speech fight. 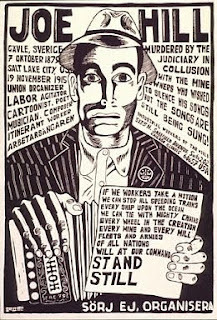 Fellow Worker Duda used a slide show of newspaper clippings, photos and cartoons to show how the IWW used humor, courage and ingenuity to win a hard-fought battle against censorship and the dishonest recruitment strategies of the “job sharks” of the American West. Later, at dinner time, participants engaged in a serious round-table discussion of the IWW’s strengths and weaknesses and how we can build the One Big Union in 2010. After a day packed with workshops, lectures and discussions, everyone was ready to let loose. A crowd of people gathered at the Zodiac music venue to dance, drink and listen to an impressive lineup of bands and artists, many of them members of the IWW. From traditional labor folk songs straight from the Little Red Songbook to bizarre dance mixes about spooning, there was something for everyone. The music continued late into the night and many wobblies continued to celebrate at the homes of their hosts. Sunday was much more relaxed. Folks gradually flocked to the Red Clover collective house for a day of barbecuing, games and hanging out. Meanwhile, some members carpooled to an old warehouse across town to help the United Workers Association make puppets and other props for a massive workers’ rights/human rights rally called Our Harbor Day, which will be held on May 1st at the Inner Harbor. The UWA organizers were very appreciative and the Baltimore IWW plans to continue working with them on this important event. As the sun began to set, it was at last time for everyone to go their separate ways and for us in Baltimore to say goodbye to our guests. 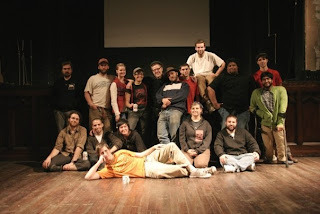 We hope that everyone found Wobfest 2010 as fun and meaningful as we did. If folks left with a little more knowledge, a few new comrades and a renewed passion for building the One Big Union, then we have done our jobs. 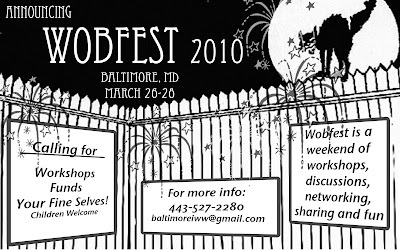 We are pleased to announce that the registration website for Wobfest 2010 is now available at http://wobfest.iww.org . (Thanks to FW Walt Weber for helping to set this up.) This website allows you to request housing and inform us of any other needs you have. It also gives you the opportunity to pay your registration fee online using your credit card or Paypal account and thereby save $5. You can also find the latest version of the event schedule on this website. Closer to the event we plan to add driving directions and other information. Also, check out our pages on Facebook (http://www.facebook.com/event.php?eid=284767869034) and Unionbook (http://www.unionbook.org/pg/pages/view/20973/). Please register ASAP so we can prepare for your arrival. And spread the word! We are super excited about Wobfest and we hope you are too. Thank you for your support and participation! P.S. We are still in need of financial contributions to pay for the space, food, and other expenses. Please contact us if you can help us meet our fund-raising goals. Thanks again! Informal networking, breakout meetings, fun ad-hoc workshops, games, etc. 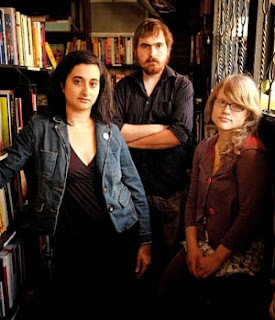 Red Emma's, Baltimore's only unionized, collectively-run bookstore and coffeehouse, celebrated its five year anniversary in November 2009. Since its inception, Red Emma's has hosted hundreds of speakers and extolled the virtues of fairly traded coffee, worker ownership, vegan and vegetarian deliciousness, and eye-opening literature. In March 2009, Red Emma's co-sponsored, along with the Baltimore Development Cooperative, the Indypendent Reader, campbaltimore, and the Campaign for a Better Baltimore, the City From Below conference which featured strategies for organized resistance in cities across America (and beyond). The conference took place at 2640, Red Emma's sister-space for large scale events, managed in partnership with the Saint John's Methodist church at 2640 Saint Paul St. This summer also saw the birth of a new Red Emma's project, the Baltimore Free School, located at 1323 N. Calvert St at Mount Royal. This space offers free courses to the Baltimore community, and anyone is welcome to teach a course or lead a workshop on any skill or subject. September saw the return of the Radical Bookfair Pavillion at the Baltimore Book Festival, which featured tablers of radical presses and local booksellers, as well as some incredible speakers such as Amiri Baraka, Andrej Grubacic, and Bill Ayers, among others. The Pavillion was a great opportunity to introduce Red Emma's to the greater Baltimore community as well as expose residents to some radical ideas about a number of issues. And finally, in the winter, Red Emma's again teamed up with the Baltimore Development Cooperative to launch the STEW series, a monthly-or-so fundraising dinner held at 2640 in which participants directly decide which of the community/arts organizations presenting between dinner courses receive the proceeds of the evening. This gives diners the opportunity to make direct connections between where their donated money goes and the organizers trying to sustain wonderful projects in and around Baltimore, all over a 4 course meal of delicious, locally sourced food. 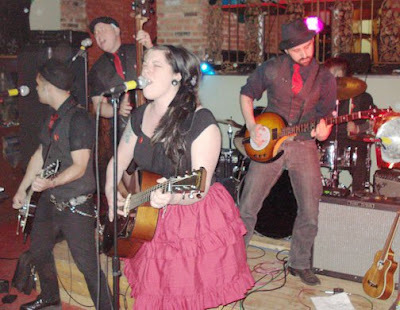 All in all, 2009 was a busy year of organizing and growth for the Red Emma's collective, and 2010 shows no signs of slowing down. Onward!! This article originally appeared in the Fall 2009 print edition of Paper Heart (Issue #1). In the hopes that tales like this from our membership will become a regular feature of the Paper Heart, I share with you an example of cost-benefit analysis in action at my old retail job. imagine what things were like for those of us who had to be there all day long. Underneath our store aprons, mandatory collared shirts, and often undershirts, we all got pretty sweaty. conditioning. Brilliant. If my store had some level of organization among the workers, perhaps we could have tried something like that. Hell, we even had three different types of fans for sale sitting around. But we weren’t organized, so we didn’t get together to do something. We were on our own. there is a perfect logic to it. There’s no reason for a business owner to sink money into a store that won’t be there for long. It makes more sense to just let workers and customers sweat it out over the next two summers. That’s the rationale of capital, and it shows why we need to destroy capitalism. I agreed with my manager that leaving the AC broken was pretty reasonable under the circumstances, and told him I was sure the customers I talked to would see it that way too, if I explained it to them like that. At that point his face took on a disappointed, somewhat disgusted expression, and told me calmly, “You have a bad attitude.” A week later I was fired. This article originally appeared in the Fall 2009 print edition of the Paper Heart (Issue #1). On October 5th, Ernesto Lizcano of the TRW Workers Coalition and Israel Monroy of the Coalition for Justice in the Maquiladoras (CJM) made a stop in Baltimore during their month-long tour of the United States focused on educating labor groups on the struggles and tactics of CJM. Their talk, sponsored in part by the Baltimore IWW branch, captivated participants with its nuanced focus on the current situation facing so many workers in Mexico due to the continuing ramifications of NAFTA. Ernesto Lizcano shared the story of the TRW Auto Plant workers. The plant, located in Reynosa, in the Mexican state of Tamaulipas, only a few miles from Texas, is one of the largest automotive plants in the region, manufacturing parts for shipment to the United States and abroad through the NAFTA highways found only a few miles from the production center. In March of this year, in retaliation for deciding to organize their own bargaining voice rather than join the corrupt and only official union in the country, 1000 TRW employees were fired. 800 of the fired workers were members of the coalition. These fired workers have since been blacklisted, unable to find steady employment, with several of them forced to sell simple trinkets on the street for mere coins. And yet, their voice still remains strong, as they have been organizing demonstrations outside their former employer’s factory and throughout Tamaulipas. Tamaulipas is seen as central to international capitalism within the NAFTA zone. The northern part of the state hosts countless maquiladoras owned by U.S. and Canadian companies exploiting the wealth of cheap labor which is found in northern Mexico. Many of the workers in these factories hail from southern Mexico and other Central American countries and have decided to stay in Tamaulipas for some time in order to save money before they attempt to cross the border in an effort to forge a living within the U.S.
Internally, Mexico’s labor movement continues to grow against the oppression of both the Mexican state and foreign investors. As part of the effort to build national solidarity, several TRW employees and CJM members have begun participating in an exchange program between Zapatistas & labor organizers in Northern Mexico, creating bonds and educational channels between Mexico’s urban and rural working class. Just as Ernesto, Israel, and the work of the CJM have inspired so many across the U.S., their work and achievements have also been inspired by international movements, namely the women of Morocco and Argentina and Brazil’s growing landless peasant movement. As they inspire us, fellow workers of the world are also turning to their brothers and sisters in the U.S. for inspiration and solidarity. As always, the time for hard work and dedication is upon us. This song appeared in the Fall 2009 print edition of Paper Heart (Issue #1). I guess you know his name. By songs no one can kill. On April 29th 2009 t he Baltimore General Membership Branch of the Industrial Workers of the World gathered at the 2640 Collective Event Space. Workers prepared and shared a wonderful meal and much conversation. At the large inter-industry gathering, the workers discussed the creation of this the first issue of our branch newsletter. A lively discussion and brainstorming session followed about what to name our publication. After much debate the name “The Paper Heart”won the support of the majority of workers present. “The Paper Heart” is a reference to a song written by Si Kahn appearing on the Smithsonian Folkways Recording: “Don't Mourn-Organize! : Songs Of Labor Songwriter Joe Hill”, which recounts state execution of the famed IWW bard Joe Hill. The immigrant song-writer and labor agitator was framed on a murder charge by Utah authorities. Despite worldwide protests and even the intervention of President Woodrow Wilson, Hill was executed by a firing squad on November 19, 1915. It is said that on the day that he was to die, Joe Hill pinned a paper heart to his chest--so they would know where to aim, Joe said. We dedicate this issue to that spirit of resistance that Fellow Worker Hill so beautifully exemplified. Welcome to Paper Heart's blog! Welcome to the brand new blog version of Paper Heart! Paper Heart is the official newsletter of the Baltimore General Membership Branch of the Industrial Workers of the World (IWW), a militant, democratic rank-and-file labor union founded in 1905 and currently organizing for workers' rights and empowerment in several countries around the world. The newsletter was first envisioned as a quarterly print publication. However, we recently decided to change the format of our newsletter to a semi-annual print edition along with this blog, which will be updated continuously as new submissions arrive. Over the next few days, we will post some selected stories from the first (and so far, the only) print edition of Paper Heart. Then, as new submissions are received, we will publish them here. Stay tuned for updates!